Putin remained upbeat in his vision while announcing a new budget plan designed to ward off the spreading crisis in Europe. In Thursday’s budget address, Russia’s President Vladimir Putin said that the country should “withstand the factors of instability – high inflation and a budget deficit” while Prime Minister Dmitry Medvedev set a new budget requirement to cut government expenses in 2013 and secure 200 billion rubles ($6 billion) for an anti-crisis reserve. “We learned a lot from the experience of the 2008 economic crisis and have started preparing probable changes,” said Medvedev, explaining that the new amendment to the Budget Code is an attempt to prepare for the possibility of a new crisis. Putin dealt with several aspects of Russia’s economy, ranging from the country’s post-crisis economic recovery at the beginning of 2012 to high oil-prices, dependency on energy resources, and ineffective spending policies. 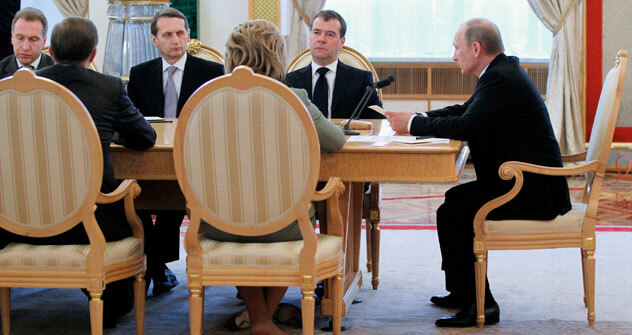 Authorities have been discussing Russia’s 2012-2013 budget strategy since January when Putin confirmed that the country’s spending would be based on the world’s oil price over the next five to 10 years. The budget amendments will be reviewed by the State Duma in the fall, and are slated to take effect in 2013. Russia will decrease its expenses in the amount of about 340 billion rubles ($10 billion) to maintain its budget in 2012-2014 years, the country’s Finance Minister Anton Siluanov told Kommersant Daily. He proposed rejecting new projects as well as reallocating expenses. Russian officials said the anti-crisis reserve would be used to support economically and socially vulnerable citizens and organizations in the case of a downturn. However, this move will only come into force if other anti-crisis measures are ineffective, Economic Development Minister Andrei Belousov said in an interview to Kommersant. Some officials said Russia has to focus on how to adjust its economy to a lower oil price of $60 per barrel, which would have a significant impact on the budget and the country’s prosperity.